Conical tree with peeling; white bark. Dark green leaves turn yellow in autumn. Yellow-brown catkins in spring. A rounded tree with greyish downy winter buds that open to dark green leaves; turning red or yellow in autumn. Clusters of white flowers in late spring are followed by orange-red berries. A tree or multi-stemmed shrub with; spreading; tiered branches. Dark green; glossy leaves; turn red and purple in autumn. Small white flowers are followed by blue-black berries. A spreading tree with glossy; mid-green leaves and goblet-shaped; pink flowers outside and white inside; produced from mid-spring to early summer. A spreading tree with bronze leaves when young. Pretty double pink flowers in pendent clusters in late spring. Conical tree with shaggy; red-brown bark when young. Diamond-shaped; glossy; green leaves turning yellow in autumn. Yellow-brown catkins in spring. A bushy tree with dark green leaves. Goblet-shaped; very dark purple-red flowers produced in early summer and intermittently into autumn. A spreading tree with bronze leaves when young. Pretty bowl-shaped; white flowers in mid-spring. A large bushy shrub with lustrous deep green leaves with recurved margins. Clusters of sweetly scented; creamy white flowers. A rounded tree with mid-green leaves and star-shaped; very pale lilac-pink flowers in mid-spring before the leaves. Beautiful single red flowers with attractive glossy green leaves. A broadly conical tree with dark green leaves; which turn deep crimson purple in autumn. Small green flowers are surrounded by white bracts; eventually turning red-pink; followed by strawberry-like fleshy red fruit. For over 50 years Palmstead Nurseries have been producing quality nursery stock to meet the needs of the Landscape and Amenity industry. Since our small beginnings in 1968; nestled deep within the North Downs, our company has grown to meet demand and is now situated on a single, highly efficient 53 hectare site in the heart of the Kent countryside. Annual production has increased to in excess of one million containers and two hundred thousand field grown trees. We now stock a huge, diverse range of products to suit any purpose and we pride ourselves in our ability to provide you with premium quality plants at affordable prices. Our current site is ideally located within 2 miles of the rapidly developing historic market town of Ashford. We benefit from excellent communication links to the major motorway networks. We are now one of the leading producers of nursery stock and our reputation for quality and trading integrity is widely acknowledged. We believe that the key to this success is our ability to listen and respond to the needs of the industry. We hope you enjoy our new website and find it informative, however, to fully appreciate the scale and quality of our production we invite you to visit us at your convenience. A spring walk is always a great idea. It’s a great way to escape from life’s daily stresses, soaking up some of the first warmth of the year and seeing all the colour emerging from the dark, wintery landscape. You can stop and watch as nature wakes up around you. It’s an unmatched feeling when you can finally enjoy the warmth of the sunshine, see trees bursting into leaf, smell the emergent flowers or watch the birds nesting. This time of the year definitely improves the mood and is great for our sense of wellbeing. Last weekend I enjoyed a spring walk around the area where I live. 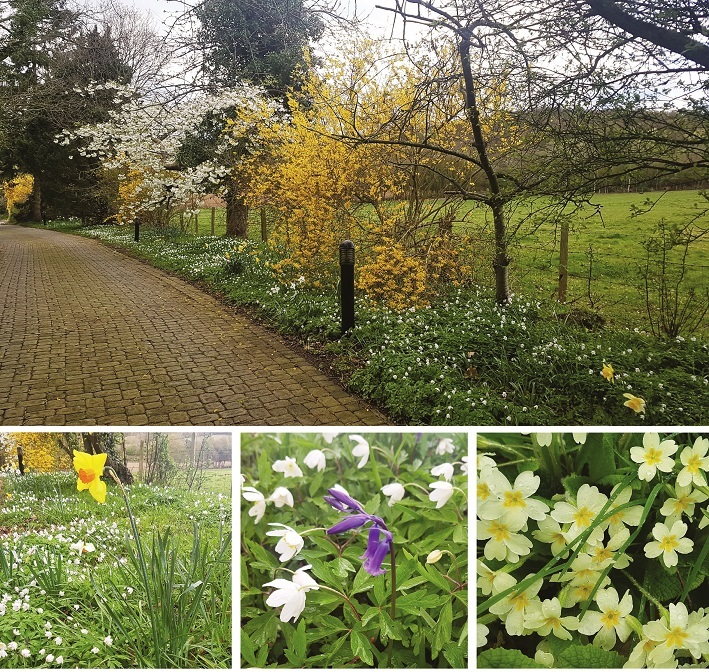 It was such a pleasant time seeing all the flowers in bloom…beautiful flowering Cherries, Forsythias, Daffodils, Bluebells, Anemones, Primroses… all looking absolutely stunning as you can see from my photographs. If you have not immersed yourself in spring yet then go and explore the great outdoors this weekend and make the most of this beautiful season.